Why our ministry is different than others! Many believers who have a heart for the Jewish people support organizations which provide humanitarian aid or assist the Jews in leaving areas of persecution to return to Israel. This is a righteous and biblical endeavour. However, Sid Roth and Messianic Vision Canada have been commissioned by God with a different strategic assignment; to see the Jewish people receive Jesus as their Messiah, and enter the Kingdom of Heaven. This ministry has been called “for such a time as this” to operate from an eternal perspective during the greatest awakening in history. “We are created to proclaim the Good News. 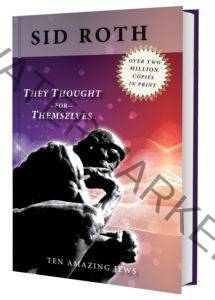 Your gift of $77 will send 7 copies of “They Thought For Themselves” to a Jewish household in Canada. Will you help us to reach our goal of mailing 2 million copies within Canada and the United States? Help us mail the french translation books as part of an evangelistic campaign to the Jewish french speaking people in Canada and France. With your support, we can fund this project and achieve our projected expenses of $140,000 CDN. 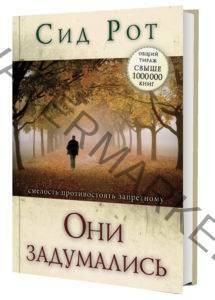 Sid’s evangelistic book is translated into Russian and mailed to Jewish neighbourhoods in Canada and Ukraine. They are also given out free to the Jewish people attending our outreach events. Let God reveal the amount to invest in this Jewish ministry. Middle East Television- The next level! My calling is to reach hundreds of thousands of non-believing Jews and Muslims and train them in the supernatural. Now God has entrusted us with Middle East Television (METV) and the potential of reaching 150 million viewers in 25 countries in the Middle East. We are ready to take METV to a new level. It’s time for television to reflect the next move of God’s Spirit. It is my vision for METV to attract a large audience with interactive supernatural programming. I say interactive because I believe that physical healing will manifest in many Jewish and Arabic people and that they’ll receive supernatural hope and encouragement in times of trouble. On METV I will be able to broadcast live, whenever God prompts me, to every home in Israel with a TV. In a time of war, imagine filling the airwaves with a message of hope! I also see us capturing Bible prophecy as it is happening. This is BIG! The only hope for unsaved Jews and Muslims in the Middle East is Jesus! Pray for this amazing miracle opportunity and consider investing in this historic, end-time event. Your gifts will help the entire nation of Israel to be saved! Now is the time to favour Zion! How many souls will you invest in for The Kingdom? Please prayerfully consider a special gift for these projects. Your generous support helps us to fulfill God’s mandated directive to spread the good news of Jesus, The Messiah to the Jew first.